Researchers at MIT and Brigham and Women’s Hospital have designed and demonstrated a small, ingestible voltaic cell that is sustained by the acidic fluids in the stomach. Using ingestible electronic devices, a team of engineers harness stomach acid to power tiny sensors. Researchers at MIT and Brigham and Women’s Hospital have designed and demonstrated a small voltaic cell that is sustained by the acidic fluids in the stomach. The system can generate enough power to run small sensors or drug delivery devices that can reside in the gastrointestinal tract for extended periods of time. This type of power could offer a safer and lower-cost alternative to the traditional batteries now used to power such devices, the researchers say. Traverso, who is also a gastroenterologist and biomedical engineer at Brigham and Women’s Hospital, is one of the senior authors of the study. The others are Robert Langer, the David H. Koch Institute Professor at MIT; and Anantha Chandrakasan, head of MIT’s Department of Electrical Engineering and Computer Science and the Vannevar Bush Professor of Electrical Engineering and Computer Science. MIT postdoc Phillip Nadeau is the lead author of the paper, which appears in the February 6 issue of Nature Biomedical Engineering. Traverso and Langer have previously built and tested many ingestible devices that can be used to sense physiological conditions such as temperature, heart rate, and breathing rate, or to deliver drugs to treat diseases such as malaria. “This work could lead to a new generation of electronic ingestible pills that could someday enable novel ways of monitoring patient health and/or treating disease,” Langer says. These devices are usually powered by small batteries, but conventional batteries self-discharge over time and pose a possible safety risk. To overcome those disadvantages, Langer and Traverso worked with Nadeau and Chandrakasan, who specialize in developing low-power electronics. The research team took inspiration from a very simple type of voltaic cell known as a lemon battery, which consists of two electrodes — often a galvanized nail and a copper penny — stuck in a lemon. The citric acid in the lemon carries a small electric current between the two electrodes. To replicate that strategy, the researchers attached zinc and copper electrodes to the surface of their ingestible sensor. The zinc emits ions into the acid in the stomach to power the voltaic circuit, generating enough energy to power a commercial temperature sensor and a 900-megahertz transmitter. In tests in pigs, the devices took an average of six days to travel through the digestive tract. While in the stomach, the voltaic cell produced enough energy to power a temperature sensor and to wirelessly transmit the data to a base station located 2 meters away, with a signal sent every 12 seconds. Once the device moved into the small intestine, which is less acidic than the stomach, the cell generated only about 1/100 of what it produced in the stomach. “But there’s still power there, which you could harvest over a longer period of time and use to transmit less frequent packets of information,” Traverso says. The current prototype of the device is a cylinder about 40 millimeters long and 12 millimeters in diameter, but the researchers anticipate that they could make the capsule about one-third that size by building a customized integrated circuit that would carry the energy harvester, transmitter, and a small microprocessor. “A big challenge in implantable medical devices involves managing energy generation, conversion, storage, and utilization. This work allows us to envision new medical devices where the body itself contributes to energy generation enabling a fully self-sustaining system,” Chandrakasan says. Once the researchers miniaturize the device, they anticipate adding other types of sensors and developing it for applications such as long-term monitoring of vital signs. “You could have a self-powered pill that would monitor your vital signs from inside for a couple of weeks, and you don’t even have to think about it. It just sits there making measurements and transmitting them to your phone,” Nadeau says. Such devices could also be used for drug delivery. In this study, the researchers demonstrated that they could use the power generated by the voltaic cell to release drugs encapsulated by a gold film. This could be useful for situations in which doctors need to try out different dosages of a drug, such as medication for controlling blood pressure. The research was funded by Texas Instruments, the Semiconductor Research Corporation’s Center of Excellence for Energy Efficient Electronics, the Hong Kong Innovation and Technology Commission, the National Institutes of Health, and the Max Planck Research Award. Could Stem Cells be the Link Between Bacteria and Cancer? 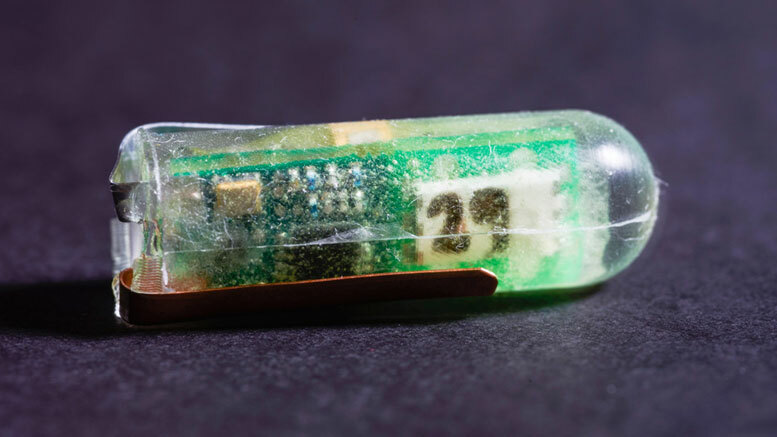 Be the first to comment on "MIT Engineers Harness Stomach Acid to Power Tiny Sensors"